Kars4Kids: In two of your programs, volunteers spend time reading to groups of children in the classroom in 15 or 20-minute shifts. How often do the volunteers go into the classroom and run the program? How did you decide on the most efficient length of time for a reading session? Chris Otis: The SMART (Start Making A Reader Today) program is built on two key research-based principles that support successful early literacy: shared reading time and access to books. In all of the SMART programming, volunteers are spending time one-on-one with children, focused on enjoying books together. Importantly, we are not teaching reading but are engaging young students in books in order to ignite an interest in reading, build confidence, and bring the joy of books and reading to children. Volunteers meet with their SMART students each week, at the same place, the same time, and with the same students over the course of the program’s seven-month duration (October-May). 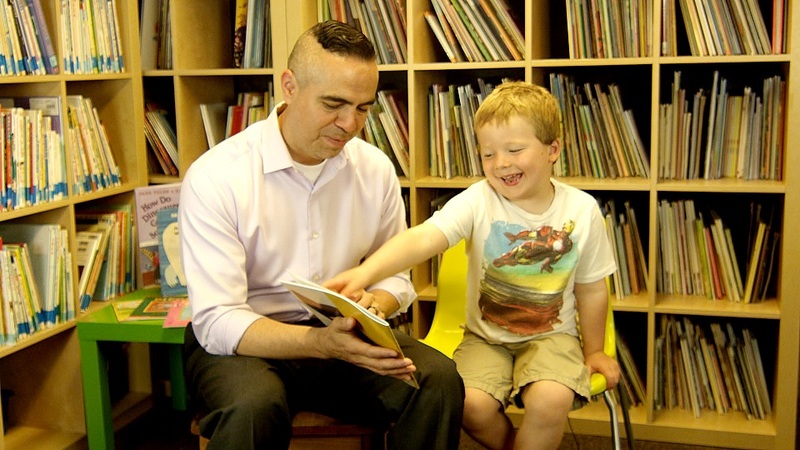 At the PreK level, reading sessions are fifteen minutes based on what’s developmentally appropriate for students of that age, but in general, reading sessions last for thirty minutes. In our Standard program, students are selected by their teachers for SMART. Teachers consider a number of factors when selecting students for the program: students who would benefit from one-on-one reading time, students who would benefit from selecting their own books to keep, students not being served in other programs, and students who would benefit from opportunities to increase their enjoyment of reading. In our PreK program and in some of our Kindergarten programming (KSMART), we are serving the entire class. In this model, volunteers are still reading one-on-one with students but rotate throughout the course of an hour to include different students so that, over the course of the reading time, each student participates in an individualized session. 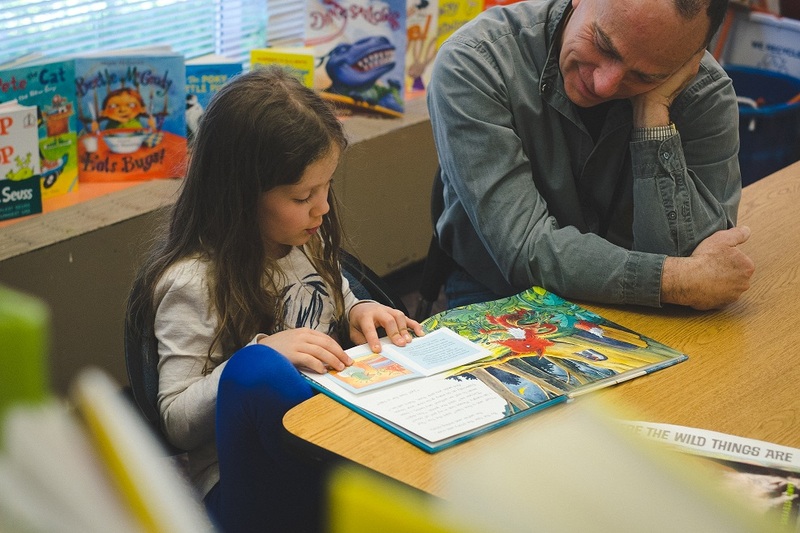 Kars4Kids: A study by the Eugene Research Institute found that fifth graders who participated in SMART are 60 percent more likely to reach state reading benchmarks than similar students who did not participate. To what do you attribute this success? Chris Otis: Research shows that shared reading time and access to books are two of the critical factors associated with successful early literacy. Students who participate in the SMART program get weekly, individualized reading sessions with the same adult volunteer as well as two new books each month to keep and build a personal library. 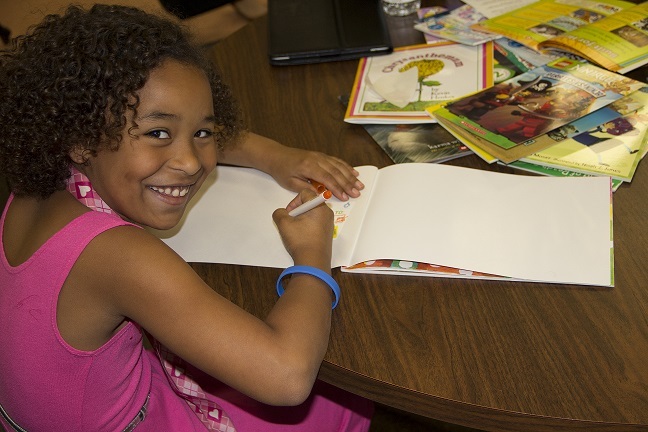 Kars4Kids: Why is giving children books to take home, part of your programs? Chris Otis: There is compelling research related to the value of children having access to and ownership of books. Chief among these is a study conducted through a joint collaboration of Learning Point Associates and Reading is Fundamental. Their evaluation resulted in some of the clearest understanding of just how vital book ownership is to a child’s reading development. Providing children with access to books improved attitudes toward reading and learning, while increased time spent reading is related to improvement in reading performance and is instrumental in helping children learn the basics of reading. Additionally, studies have examined educational outcomes for children raised in homes with books and in “bookless homes.” Results show that having a 500-book library in the home produced an additional 3.2 years on average of additional education achievement compared to living in a home without books. Even having as few as 25 books in the home produced an additional 2 years of total educational achievement, on average. Kars4Kids: Is there a vetting process for volunteers other than the three checkboxes provided on the website? How does it work? Are most of your volunteers, retirees? Chris Otis: All SMART volunteers go through an online application and orientation process (available at www.getsmartoregon.org). Each volunteer is then screened through a national background check. Once placed in the program, volunteers also receive additional on-site training. While the majority of SMART volunteers are over the age of 50 and many of them are retired, we have adults of all ages volunteering with us. We engage lots of volunteers who receive support from their employers to participate in the SMART program, and many of our corporate supporters have teams of volunteers who participate. Kars4Kids: SMART was founded in 1991 and it’s a low-tech solution to getting kids reading. The internet and technology, on the other hand, have exploded since that time. It’s difficult to use technology without being able to read, and technology also means more exposure to words. Has SMART seen the technology explosion as having a positive effect on reading? Chris Otis: While our focus is on engaging young students in books and reading, we are supportive of other opportunities for getting kids excited about reading, including those that incorporate technology. We haven’t closely studied the effects of technology on reading, but we are focused on research that shows the importance of print-rich environments for kids, and we’re committed to continuing to provide access to print through a wide variety of books and other reading materials. Kars4Kids: Are there any SMART volunteers who were with you in 1991, who are still going strong? What makes them keep going? Chris Otis: We are fortunate to have many volunteers who have been engaged with us since the program began. And, there are many others who have been with us for a decade or more. A lot of volunteers tell us that they originally got involved with SMART because they wanted to support children in their community. After having participated, they realized they were getting as much out of the program as the kids were. Whether a volunteer has been involved for just one season of SMART or they’ve been with us for years, the draw is the same: There’s a simple beauty in sharing a book with a child. Kars4Kids: Do you have any SMART participants who grew up to volunteer with you? Do the children build lasting connections with your volunteers, and with the SMART, in general? Chris Otis: Because we’ve been around for over 26 years, there are thousands of early participants who are now adults and are doing their part to “give back” to the community. A number of these early SMART students have found their way back to us and are now volunteering in the program. It’s wonderful to hear their memories of the program and to have them now engaging with us to bring up the next generation of engaged and excited readers. Kars4Kids: Do you have any children who stay in SMART programs for consecutive years? How long do most children remain SMART participants? Chris Otis: Children are selected for the SMART program each October and will remain in the program until the following May. Because teachers are largely responsible for selecting students for participation, we don’t control whether or not a child will participate in successive years. But, many times, a student who is selected for participation in one year will also be selected by their teacher the following year. Kars4Kids: What are the most popular books among your participants? What makes a book beloved? When it comes to a good book and one that will engage a child, the beauty is in the eye of the beholder. Our job is to get a wide variety of books in front of kids and to offer them an array of stories and choices. Kars4Kids: What’s next for SMART? Chris Otis: This year we will serve over 11,300 kids across Oregon. And we’re focused on bringing them an exciting and engaging opportunity each week to read and enjoy a book with a new friend. As we look toward the future, we’re piloting a new SMART model that serves students outside of school. OST SMART has a focus on summer programming, after-school programming in partnership with other nonprofit providers, and Community SMART, which allows us to take our program to specific communities and agencies. OST is being developed to help us reach students we’re not currently serving and to engage volunteers who are not presently part of the SMART family.